In parts 1-3 Shawn has pretty much covered most of I would say. 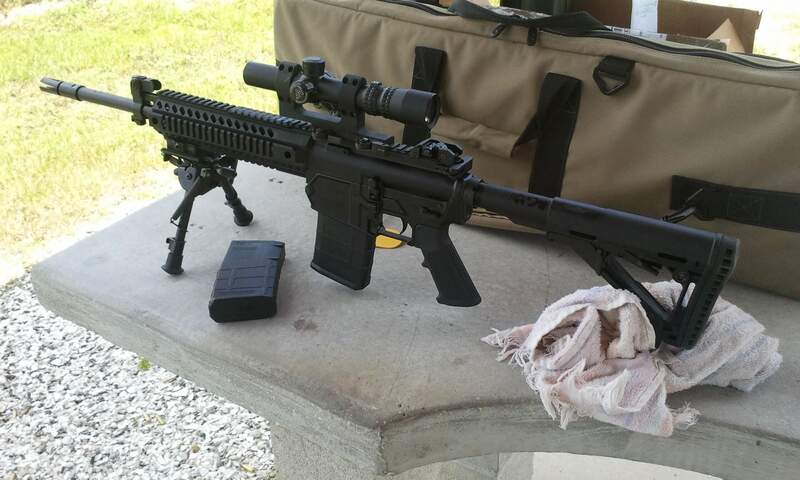 Previously, I owned an Armalite AR10 model 10A4F and I replaced that with a LMT MWS which I quickly got rid of. The Armalite was about $1500, and was a nice rifle. However with its 20 inch barrel, A2 stock, and longer then AR15 action, it make for a long almost awkward rifle. While it did deliver its guaranteed 1.5 MOA, it was neither the handy battle rifle I would have liked, nor a semi-auto precision rifle. So I replaced it with a LMT MWS. The MWS had some very nice features, but I had some issues with mine, and sold it quickly. Now having tried the Colt 901, I much prefer the Colt over the previous two rifles I owned. The 901 is surprisingly soft shooting. That’s not to say that it doesn’t have recoil, but that it is a smooth impulse. Perhaps the M1 Garand might be a good comparison. 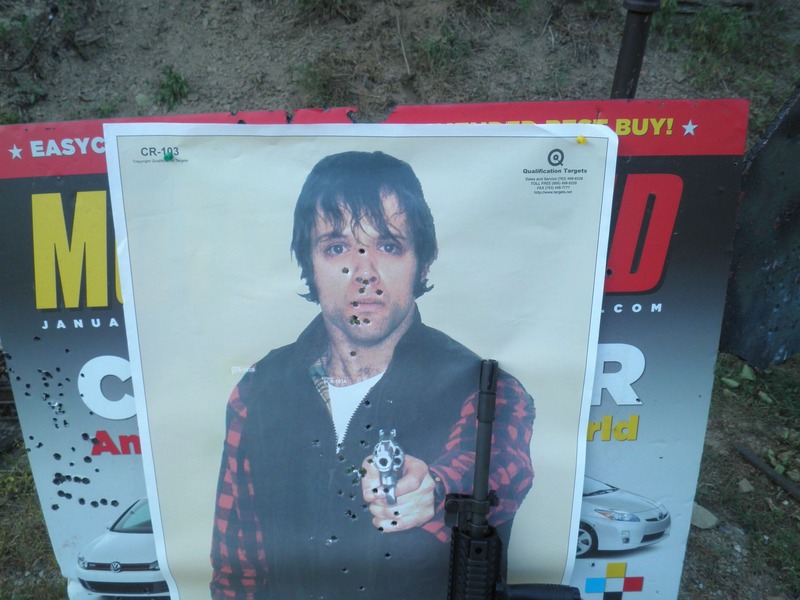 The Armalite I owned was not that pleasant to shoot, and the MWS, while nice, was still a much sharper recoil impulse. When shooting the 901 off of a Harris bipod, the rifle recoils straight back, making it easy to watch my impacts through the NightForce 2.5-10×24 scope I was using. When shooting offhand with an Aimpoint T1, the 901 recoiled smoothly up and back, I want to say that the recoil impulse is smoother than shooting a M4 with M855. I don’t want to make some claim that the rifle has light recoil, but I find it extremely fun and easy to shoot. I have noticed some people questioning the choice of the Vortex flash hider on the 901. I know it to be an excellent choice. 16 inch barreled 308s have a good deal of flash and blast depending on ammunition used. This pronged flash hider helped break up the flash and concussion from the shorter barrel, and makes the rifle much more pleasant for those around the shooter. 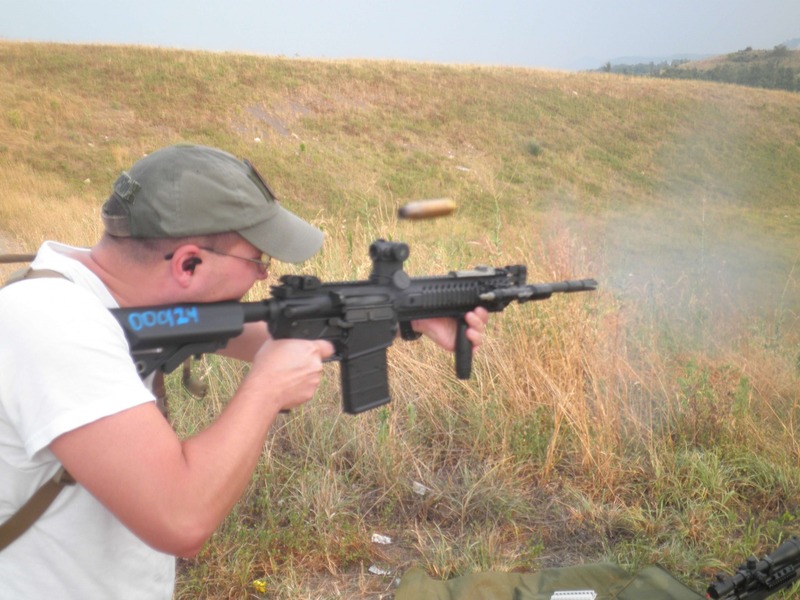 While a pronged flash hider will ring(most noticeable when dry firing), it is not noticed when firing the rifle. The 901 is not light, but in my opinion, it balances well. The Armalite rifle felt very nose heavy. The MWS, while similar weight, had most of its weight in its barrel, making the rifle far more awkward then the 901. 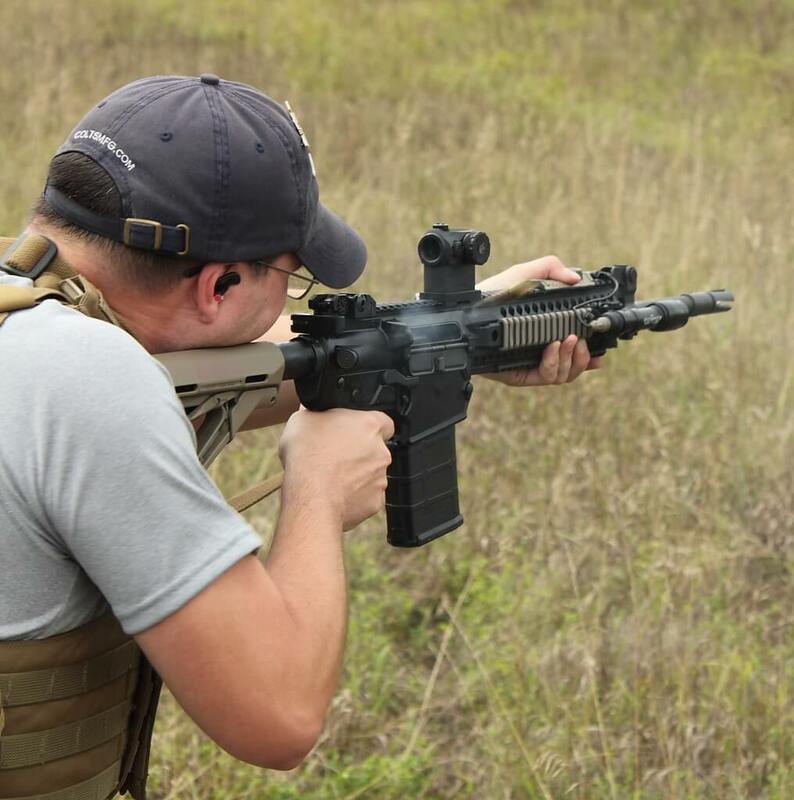 The 901 handles very similarly to a MK18/CQBR with Daniel Defense RIS II and a suppressor. It is not light, but it feels far closer to that of a M4 then the MWS. I found the 901 easier to shoot well then the MWS. 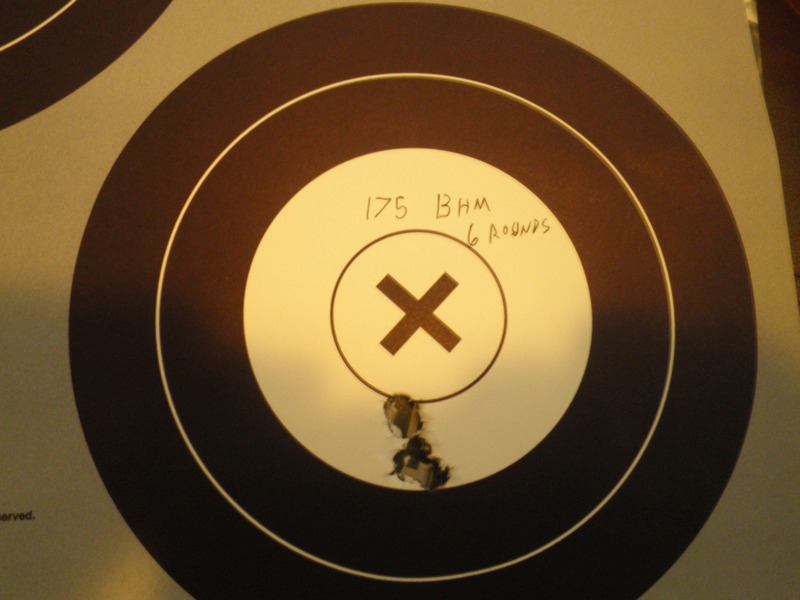 On a side note, when I tried DAG surplus 308 in the LMT MWS, I could only get 6 inch groups at 100 yards with it. It got to the point where people were making fun of me with my performance with that rifle. This same ammo gives me 2.5 inch groups in the 901. So far, in my limited testing, the 901 seems less ammo sensitive then the MWS. I spent much of the time shooting the rifle with a Magpul CTR stock, the VLTOR IMOD that came with it works very nicely as well. The Colt 901 is an awesome rifle, but it is not perfect. So there are some things you should know before you buy one. 1. The 901 uses a non-standard height front sight, so it comes with a Troy micro rear sight. Standard AR15 rear BUIS will not work unless you use a rail mounted front sight on the monolithic top rail. 2. The area where the trigger pins are on the lower is reinforced. This means if you replaced the trigger, you will want to use the slightly longer trigger pins that come with the 901s trigger. 3. 5.56 PRI Gasbuster charging handles will not work with the 901 lower. It is unknown if the BCM gasbusting Gunfighter charging handles will work. 4. The 901 comes with “Colt Spec” .308 PMags. These Colt Spec mags have an over insertion prevention tab on them. 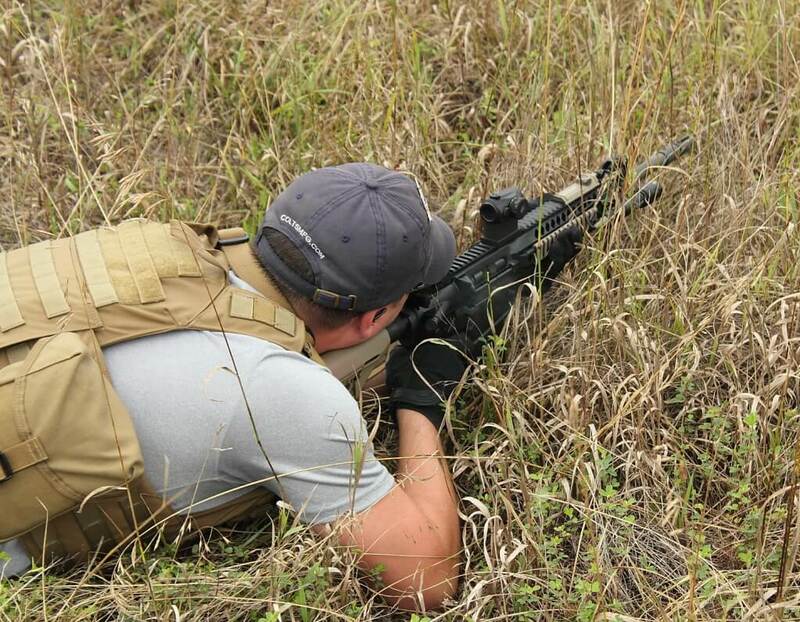 I primarily ran the 901 with standard Magpul 308 Pmags and had no issues. 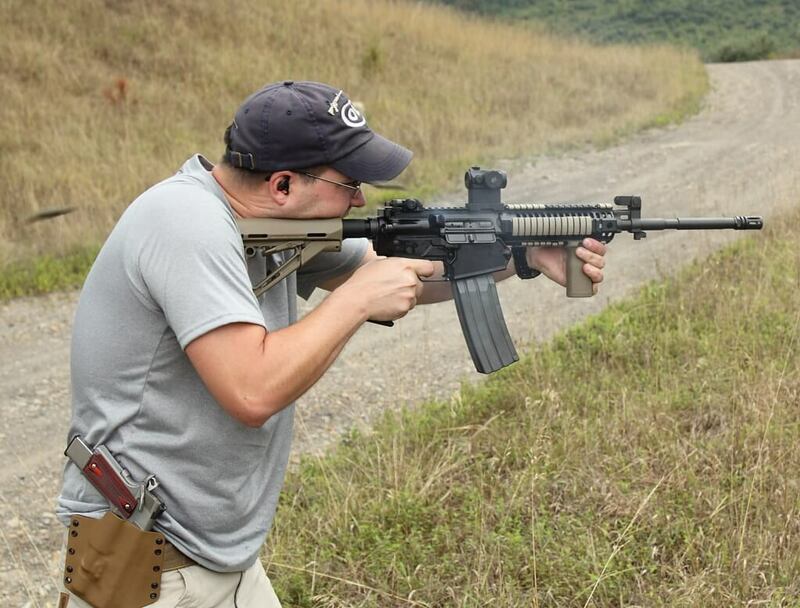 When using the standard PMags, think just like using standard GI mags in an AR15, push into the mag well, then pull to make sure it is seated. The Colt Spec mags are nice, but not mandatory. With the upper removed, I found it was a non-issue. 5. The quad rail on the 901 is tall and narrow. 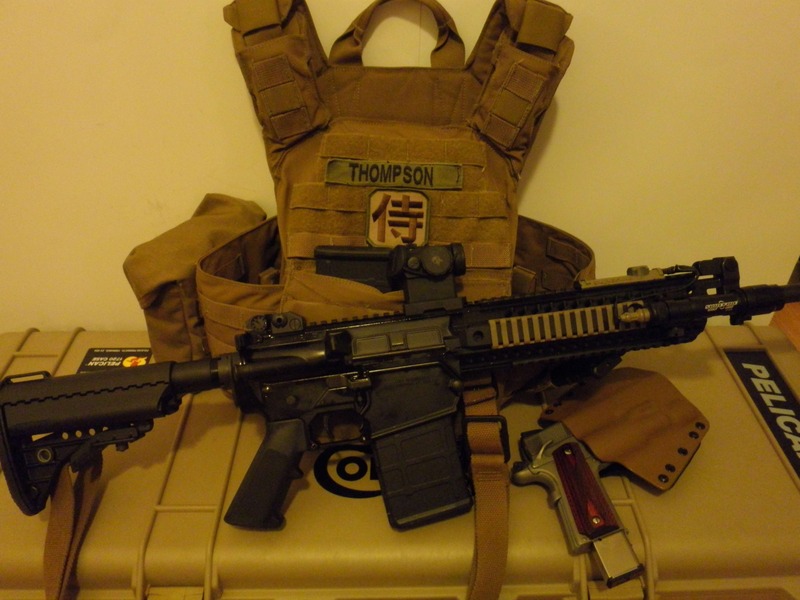 I think that rail panels might not be a good choice for this rifle, but it does work well with ladder covers. I think that LaRue index clips were a little too slick for the 901. A Knights handstop and VFGs work well on the 901, but are lower from the bore then I am used too. (I mainly use the Daniel Defense RIS II rail). 6. 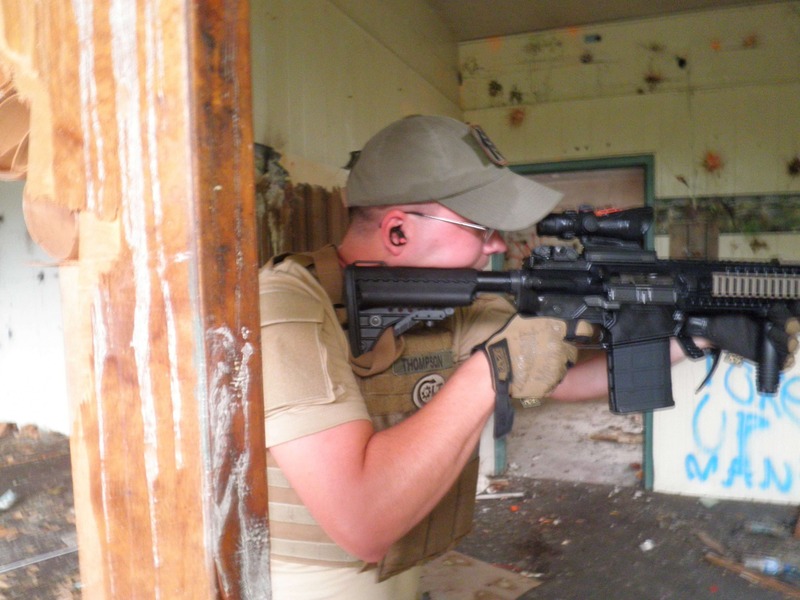 The 901 is nose heavy, however it is not too different then a M4 with accessories, or a SBR with suppressor. I find it better balanced then many of the other .308 variants I have owned or used. Please don’t read this list the wrong way, I HIGHLY recommend the 901. It is good to know these sort of things before you buy the rifle. What I am looking forward to most is having an SBR 901. I am excited about having a 308 upper, and a short 5.56 upper in the same case, with a single .30 cal can I could run on both uppers. This is the second session of LooseRounds.com Q&A. If you have a firearms related question please email it to QA@LooseRounds.com. We will post the your questions anonymously and give you our answers. Shawn and I thank Catherine Kim for the article she submitted and to thank Duncan Larsen for the articles he has submitted and for his help on our Facebook page. We also appreciate the work CJ does as an editor on LooseRounds.com, he keeps us from looking as illiterate as we are. Thanks also to Adam O’quinn for taking the 901 in action shots. 1. How are the Surefire 60 round mags? Howard: Both Shawn and I own Surefire 60 round mags and we like them very much. While we haven’t torture tested them, or run them very heavily, they appear to be good mags. 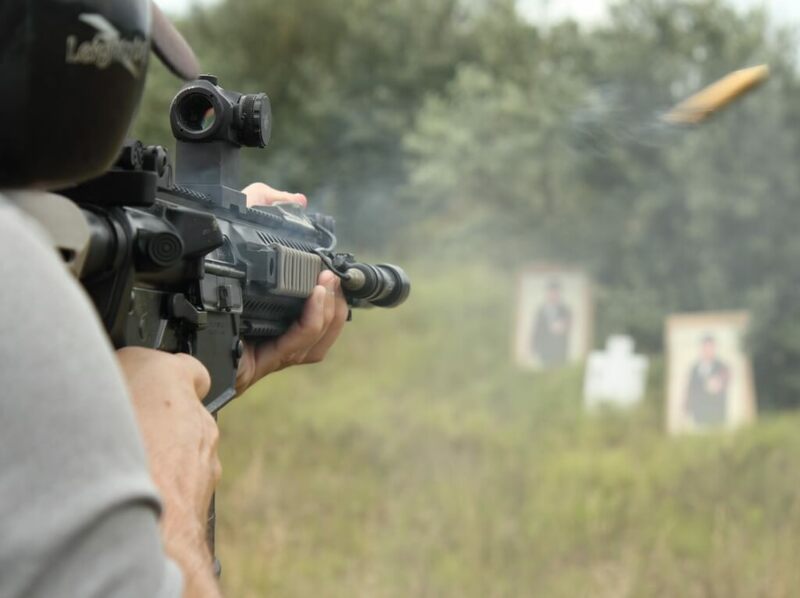 We recommend them, but be sure to test each mag before you rely on them. Howard: Well that is not much of a question. Normal wear on the bolt face may leave little pits, and a ring corresponding to the primer on the round. If any pits extend into the firing pin channel, replace the bolt. (a) Bolt faces with a cluster of pits which are touching or tightly grouped, covering an area measuring approximately 1,8 Inch across, will be rejected and replaced. (b) Bolts which contain individual pits or a scattered pattern will not be cause for rejection. (c) Bolts that contain pits extending Into the firing pin hole will not be rejected unless firing pin hole gaging check determines excess wear. (d) Rings on the bolt face (machine tool marks), grooves, or ridges less than approximately 0.010 inch will not be cause for rejection. 3. Winchester Model 70 used in Vietnam? Shawn: There were two types, one was the heavy barrel national match that had a target stock and a heavy barrel with a sporter stock. The sporter stock model started off as sporters and then the Rifle Team Equipment (RTE) armorers added match heavy barrels. Both were glass bedded and free floated by the RTE armors. Shawn: LooseRounds uses a Dark Star Gear holster kydex that can be used for IWB or outside carry. Found it to be best of its type tested so far. Howard: Right now you can get more parts and accessories for the Sig, such as cheap quality Magpul mags. However as for company quality control and function out of the box, I would trust FN more then Sig. 6. What cheap asian are good? Howard: Well, the following are optics and accessories are junk. UTG, NcStar, Leapers, Counter Sniper. Some of Tapco stuff is good, but much of it is junk. ATI is similar with mixed quality items and plenty of junk. LooseRounds has some pictures of a few new guns that are not easy to find. First the Colt 6920 with FDE anodizing. The carbine comes with Magpul MOE furniture in FDE, mags and the MBUS. The finish color looks better not under high-powered digital camera flash. Next a few shots of the Daniel Defense new rail and Front Sight Base and the DD “MK18” Clone. No bayonet lug on the DD. I am sure this will rankle some nerves, but we need to move on from worrying about a useless feature for a 16 inch barrel. Worry about marksmanship, not bayonet lugs and you will live longer. The new DD flash hider. Not sure what it does different then a standard A2 hider. Also got a look at the colt competition rifle. The colt competition has a FF smooth tubular rail with cooling vents, and a different barrel fluting and gas block. The colt rifle pictured came with a surefire brake. For those who live in the Huntington ,Wv area or within easy driving distance I always like to recommend our good friend at Herd Tactical. Herd Tactical is unlike most gun stores in the tri-state area. For one thing, you can buy high quality AR15s and other EBRs. To me, it is nice to walk into a shop and not have my choice of anything I want as long as its a hipoint 45 or 9mm with the odd lorcin added. HT also has ther best deal on ammo I have run across. Need a light for your rifle? They have it. Need some magpul coolness? Got it. Anything you want, Herd Tactical has it or will get it for you. If you have always wanted a suppressor for your evil black rifle you can get it at Herd Tactical too. Of course you have to wait, but you can stop in and play with it until paperwork comes through. HT has a nice selection of some of the most popular and high quality Ar15s out now and everything you need to keep them running. The owner of Herd Tactical is not the typical gun shop slob that sets behind the counter acting like he knows everything. The owner loves what he does and often attends training classes by the best instructors in the country. Big names like Pat Rogers and LAV. If you do not know those names, then any other 3rd rate gunstore will probably do fine for you. 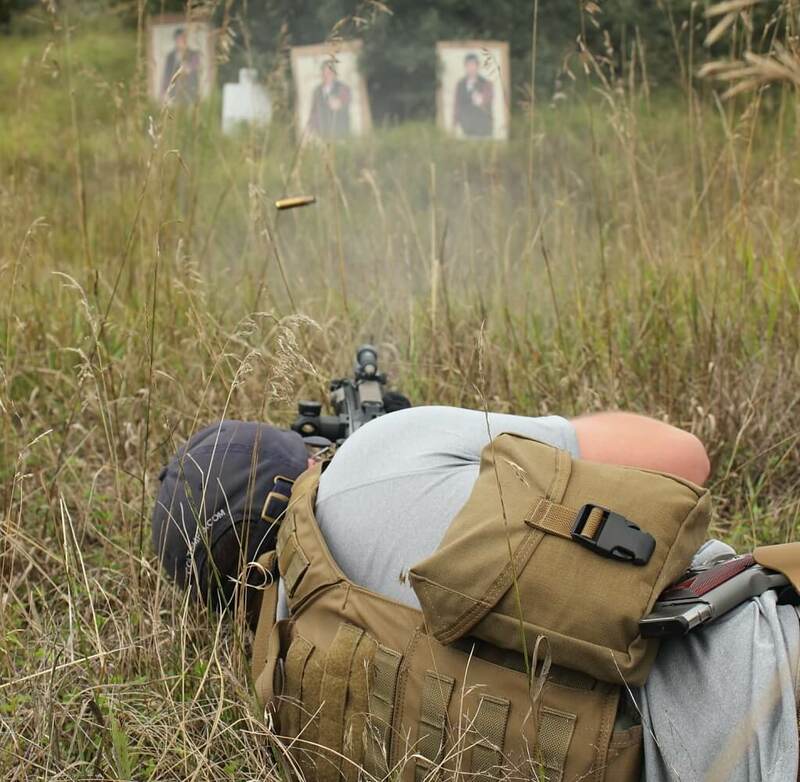 Herd Tactical also sports a wide range of targets for you to shoot at with your widowmaker. Some of the nicest steel targets I have ever seen can be purchased there along with huge selection of the typical IDPA and Q targets. Looserounds can not say enough good things about Herd Tactical and its owner. He knows what he is doing and loves the culture. Always ready to help some one out and will not try to lead you into buying some cheap el hefe special just to make a sell. If you live in the area or go to college at Marshall University , I have no idea why you are not there already!! Check out the Herd Tactical website if you are too far to drive and get whatever you need sent to the house. Follow Herd tactical on facebook to see weekly specials. Real specials not the poor excuse of sales most places have. 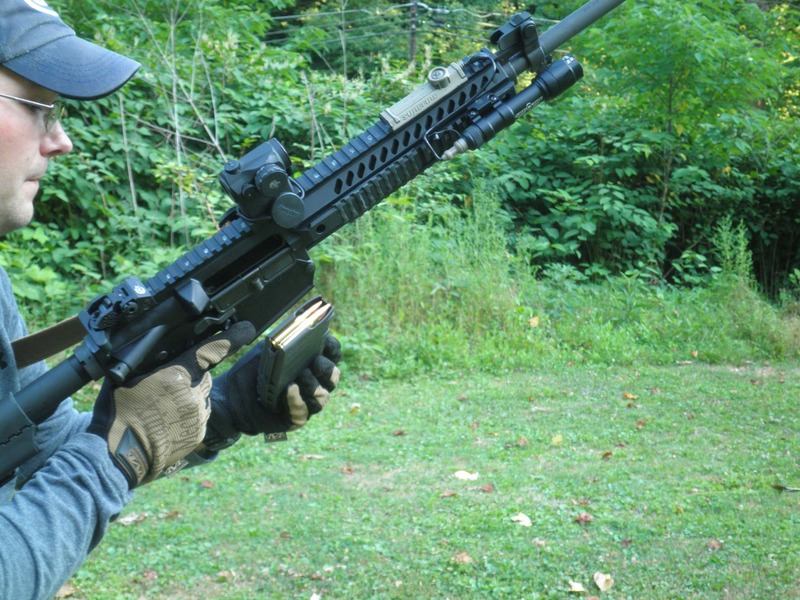 For Rifles, Handguns, ammo, Class III and training check them out!! I promise you will not regret it.